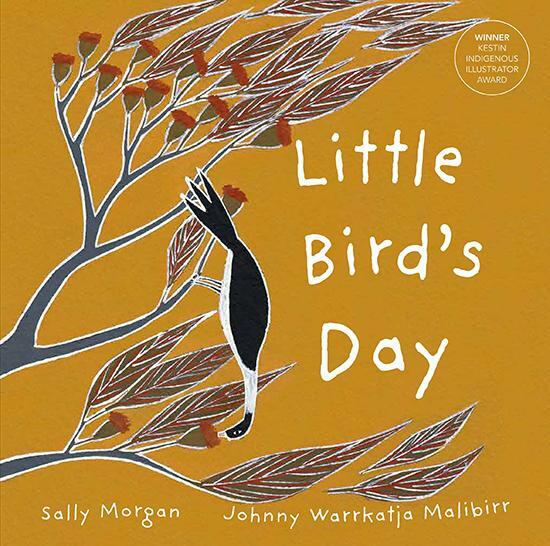 The latest book by bestselling Australian Indigenous author Sally Morgan tells the enchanting and tender tale of a day with Little Bird. The day begins in the early morning as Little Bird rises and warbles with Sun to wake all the sleeping animals. You can almost feel yourself stretching and yawning as you also stir with Little Bird’s call. Next, Little Bird discovers a feast in the flowers, delicately crimson blossoms, and then takes a playful spin across the sky with huffing and puffing Cloud. Your heart rises and leaps with joy as you feel Little Bird fly. Refreshing Rain brings the fun to a close with a sparkle, as Little Bird flutters and washes the excitement away. Until, finally, as the day moves towards its end, Dusk calls Little Bird home to roost. There she can drift off to dreams amongst the stars, and your eyes, too, will begin to feel heavy. Brought to life by the gorgeously rendered illustrations of Johnny Warrkatja Malibirr, the inaugural Kestin Indigenous Illustrator Award winner, this universally appealing story is perfect for ages 3+.